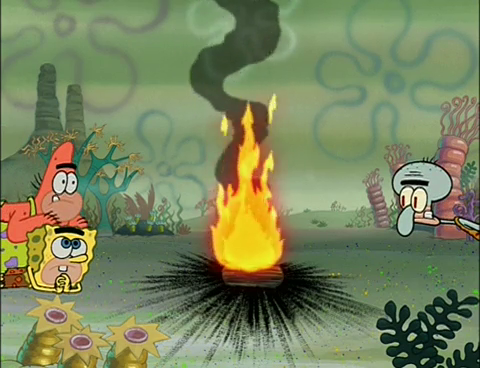 Gba.n64europe.com has put up 6 screen captures from The SpongeBob SquarePants Movie game coming to Game Boy Advance soon, which you can see here.. We don't really know much about this game so far, but it looks like in both console and handheld versions of it, you play SpongeBob and Patrick, who are teamed up together. If you haven't already seen the two pictures from the GameCube version of this game, go here. The 8-episode "SpongeGuard on Duty" DVD will be available in 6 days. Though if you want it before the release date, try checking an "Fye" store near you in the next couple days. They always get SpongeBob DVDs early. Title: Movie Trailer Attached to "Shrek 2"
Just can't wait to see Spongebob on the big screen? Then get out there and see "Shrek 2", which has the newest trailer for "The Spongebob Squarepants Movie" (the updated version) attached to it! I'm not exactly sure if this depends on the company that runs your local theater, so nothing's certain, but I did see it at mine. If you're willing to take a chance, or just want to see the movie, enjoy! In related news, as some of you may noticed, Paramount has put out stand-up cardboard advertising...things, for "The Spongebob Squarepants Movie". They use the same scheme as the theme for the movie's official site. Hopefully, this isn't what Paramount is planning on using for the advertising campaign the entire time. Spongebob reclaims its spot as #1 show on Nickelodeon this week in the Nielsen ratings, continuing the pattern of flip-flop ratings we've been seeing lately. The show pulled in two spots: the first one at #6 with 4.21 million viewers, and the second at #10 with 4.05 million. Once again, it is unknown what next week's ratings will be, but we can only hope for the best. "Paul called me a few weeks ago to work on a SpongeBob or two. He said he wouldn't be ready for me until late June and July. Of course I said YES. He told me that Nickelodeon ordered four new half-hours. Ten makes more sense -- ----, why not do one more whole season? I believe the characters are strong enough work out 24 more stories." So, this tells us a few things. There will be four new half-hour episodes (eight 11-minute episodes), production will begin in June/July, and Kaz will be involved as well! This is really good news, as we now know that there won't be a completely different writing team working on the show. "I'm not sure what Paul Tibbitt is thinking about. I know that Carl Greenblatt (my second writing/storyboard directing partner) did a freelance storyboard for one of the new episodes under Paul Tibbitt. There's no gag order on information as far as I know." Another original writer/storyboarder on board! There are 178 days until The Spongebob Squarepants Movie comes to theaters! There are 6 days until the SpongeGuard on Duty DVD comes out! 1 -- Worst episode ever!